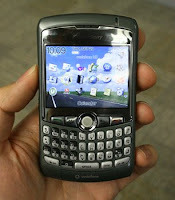 In April '07 I wrote one of my first posts entitled "My First Week With the Blackberry 8800". Now, 2 years later, my trusty 8800 is starting to show early signs of senility: it freezes, it resets itself unexpectedly and batteries run out twice as fast as before. I don't blame the trusty old device. In the last 2 years it has traveled around the globe and suffered extreme temperatures, being dropped from various heights, used for hours a day and the network switched several times a week. Add to that the fact that I loaded it with almost any software I could find, and you can understand why it wants to check out early. Camera and video camera - much missed from the 8800 and will allow me to leave my camera at home on some future trips. Geotagging will add your coordinates to the picture you take - works only if you're outside. Spell checker - finally! Now I cn snd emials wituot slepping erors. 3.5" headphone jack - I can now use my QC2 rather than a special set. The new 4.5 OS allows me to have Hebrew characters (or any other language you'd like) on my Blackberry, without resorting to arcane hacks needed in early versions. Sound recorder - nice idea, not so great execution - it actually freezes the device from time to time. All my old games and applications function seamlessly on the new device. The device is smaller than the 8800, so it does not fit in the holster I have and AT&T does not provide a new holster, just a pocket protector. And who uses pocket protectors in the 21st century? The keyboard is a throwback to the 8700 days. Clicky and plasticky. Very easy to hit the wrong keys, regardless of the size of your fingers. And did I mention small? The speaker is less than great, compared to the 8800. And the ring tones sound more metallic. You still cannot do anything else involving the network when engaged in a phone call, thanks to the stellar "Edge" network. The shiny plastic on the back of this device is quite slippery, and basically invites scratches. What's more, these cannot be deleted. I tried deleting them from the service book, but every time you do a full restart (like when you install a new software), the device senses it's missing something, and re-installs them all - for your benefit (yeah right!). The solution I found is to creat a folder, name it "useless links", drag all the links into it and hide the folder. But all in all, I'm content. It was almost painful to transfer all my old apps and settings from the 8800 to the 8310 (with the exception of losing my theme and and game I was in the middle of - small price to pay) and it activated immediately. I wonder how many miles will I get on this device?